See that big rock there? (It’s easy because there’s a big yellow arrow pointing to it.) That’s a 100-foot/30-meter wide boulder that was imaged sitting on the surface of Comet 67P/Churyumov-Gerasimenko by ESA’s Rosetta on May 2, 2015. 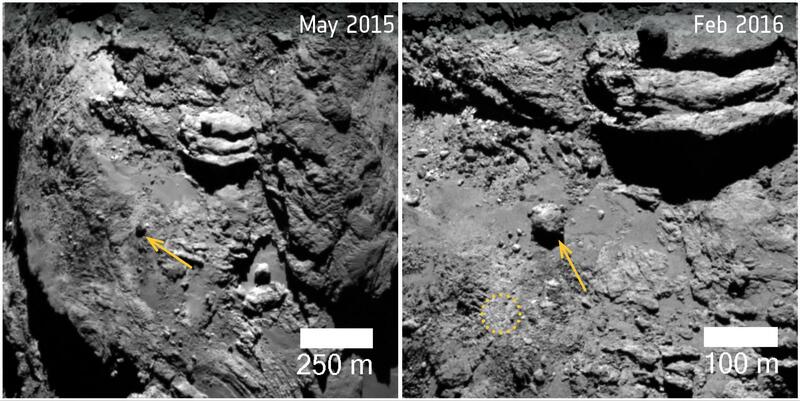 Nine months later Rosetta captured another image of the same area in which that huge stone had clearly moved—find out below just how far! The two images above were taken by Rosetta’s high-resolution OSIRIS camera on May 2, 2015 and Feb. 7, 2016. The second image shows the region from closer-up, and in it the boulder has rolled about 460 feet (140 meters)! Its former position is shown with the dotted circle. It’s not yet known whether the boulder moved because the ground beneath it shifted or as a result of an outburst nearby. 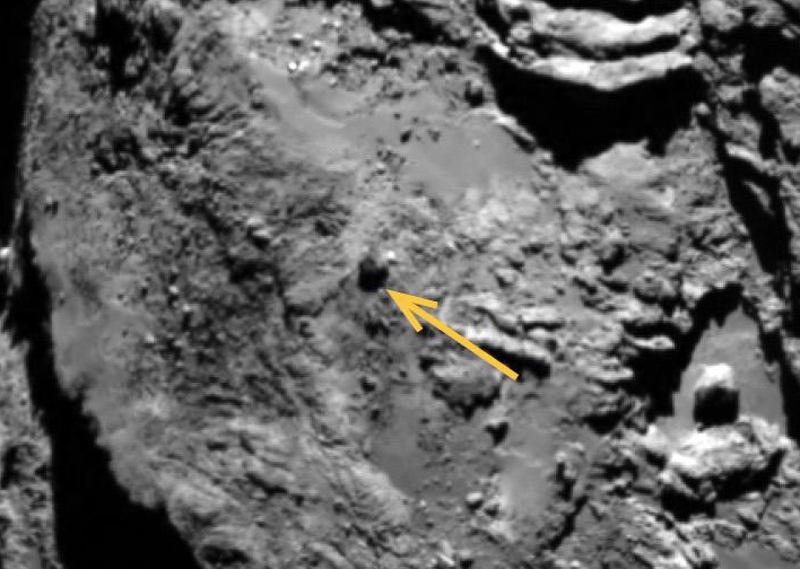 But with Comet 67P having reached perihelion (its closest point to the Sun in its orbit) in August 2015—just three months after the first image was acquired—it could have been either or even both of those. If that boulder were on Earth it would weigh about 14,000 tons! But on Comet 67p, with its small and irregular gravity, it only weighs about 1,300 lbs (600 kg). 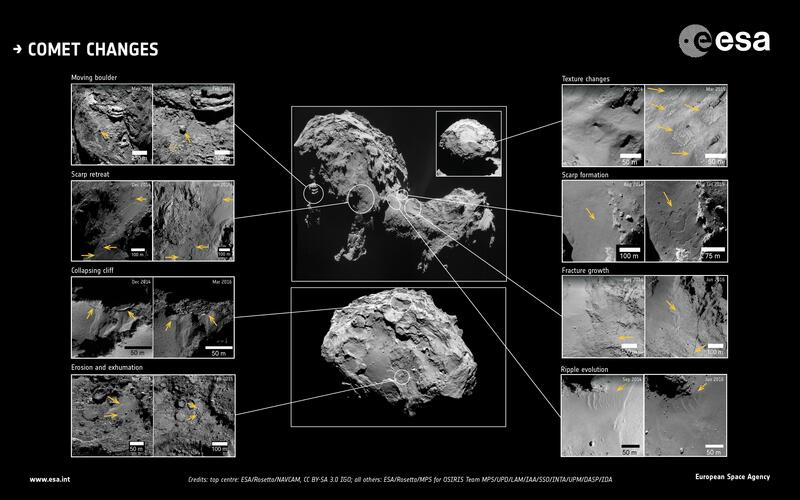 This is just one example of the many changes that Rosetta observed on Comet 67P during its more than two years in orbit. It’s proof of the dynamic nature of comets and that every time 67P swings around the Sun during its 6.5-year-orbit it’s never the same place twice!